There’s a scene in the middle of “Star Wars: The Last Jedi” that’s so mysterious, inspired, rich in overtones, and tenuously attached to the movie surrounding it that it virtually shouts its presence as the writer and director Rian Johnson’s embedded showreel, his flourish of personal purpose and creative power amid the two and a half wearying hours that serve as its frame. It’s part of a sequence that takes place in a neo-medieval island hideout where Luke Skywalker (Mark Hamill) has long been sulking (shades of Achilles in the Iliad). Rey (Daisy Ridley), one of the new generation of heroes introduced in “The Force Awakens,” in 2015, goes to that forbidding, rocky, windswept retreat in the hope of persuading Luke to come back and join her and the other heroes in the Resistance to the First Order—to which the son of Han and Leia, Ben Solo, now known as Kylo Ren (Adam Driver) has sworn fealty. While visiting Luke, Rey drops out of his sight for a moment and enters a hidden place in which she faces a vast subterranean mirrored curtain. She beholds her own reflection, reaches out to it, and sees it multiply. Suddenly, there’s a dozen or more identical Reys, all moving in unison, but then moving not in unison but in sequence, as if choreographed as a one-woman crowd in a Busby Berkeley production number, snapping her fingers and chanting a line or two, echoing outward toward an endless chorus line of Reys that seemingly recedes to infinity. The sequence is a major inspiration, a moment of conscience and solitude, which wrenches itself out of the Star Wars cinematic universe to become a symbolic experience of independent power. That’s the good news. Yes, the question of Rey’s identity, of her own sense of it, is ultimately applied to the movie’s plot. The bad news is that it’s stuck onto it, inconsequentially, to add a nub of psychological conflict; like so much else in the movie, it’s a conspicuously crafted, compulsory detail to stoke a preprogrammed response in viewers. Like most of the movie’s twists and details, it provokes the feeling of subjection to stimuli like a movie-theatre lab rat. 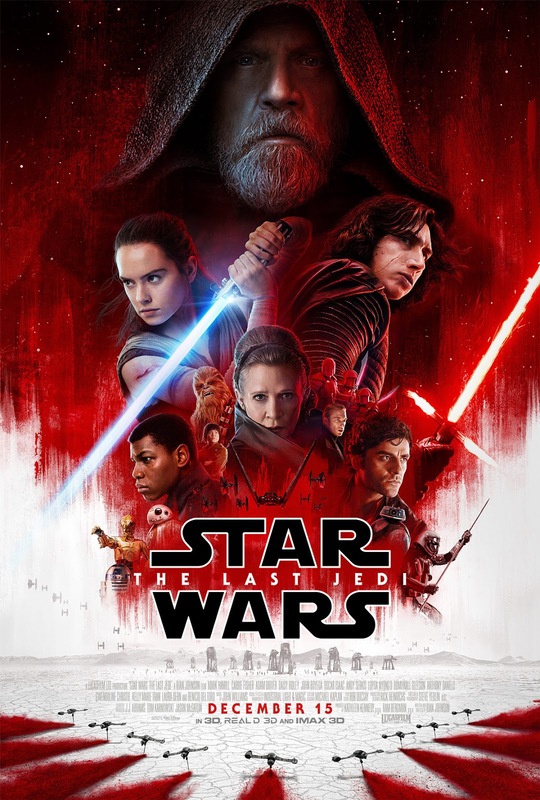 The rest of the story (which I won’t spoil) involves the attempt by the Resistance, led by General Leia (the late Carrie Fisher, in her last role) to survive and escape an onslaught by the First Order that’s led by the haughty General Hux (Domhnall Gleeson) and its Supreme Leader Snoke (Andy Serkis). It also involves matters of strategy as it meshes with temperament—and with gender difference—in the intrepid combat of the pilot Poe Dameron (Oscar Isaac). Two other Resistance fighters, Finn (John Boyega) and Rose (Kelly Marie Tran), are also in the forefront of battle, as is another officer (Laura Dern). The movie brings back beloved characters; it features a varied array of excellent actors, even some of the best of the time. Johnson is an auteur of sorts, one whose talent is ready-made for a generation of critics desperate to have one who works in popular genres and achieves popular successes, for fear that their enthusiasm for individual inspiration will isolate them from the celebrity circus of mass-market movies. He’s like Christopher Nolan but better, the other side of Nolan’s showily dour Janus-face. Unlike Nolan, Johnson has an authentically enticing virtuosity, joining a sense of vision to a sense of glee. But “Star Wars: The Last Jedi” yokes Johnson’s formidable cinematic intelligence to an elaborate feat of fan service that feels, above all, like the rhetorical and dramatic gratification of a religious sect. And what’s all the more disturbing about the experience is that—unlike inspired preachers whose own sense of fervor and possession threatens to run away with them, puts them into a public state of exaltation that they communicate to their flock—Johnson remains stolid, intelligent, in deft command. He leads, in “The Last Jedi,” not by example but from behind the curtain. Despite a few stunning decorative touches (most of which involve the color red) and that brief central sequence of multiple Reys, the movie comes off as a work that’s ironed out, flattened down, appallingly purified. Above all, it delivers a terrifyingly calculated consensus storytelling, an artificial universality that is achieved, in part, through express religious references. (I won’t give away the Biblical ones, but they’re conspicuous, including an Abrahamic one, a New Testament one, and some skillfully placed crosses.) I desperately miss the pseudo-Shakespearean dialectical wrangles and the exhilarating sense of C.G.I. discoveries that mark George Lucas’s last forays into the franchise—their sense of renewed personal investment in a cinematic universe that seemed to be growing ever more complex before its creator’s eyes, their sense that its creator was personally wrestling with a world that was escaping his own control and taking on a life of its own. Now, in “The Last Jedi,” that world has been tamed, tamped down, boxed in, neatly packaged, to a chilling extreme. It fixes its heroes in an abstemious, militarized world of twenty-four-hour-a-day work for mere survival, in which no personal life remains outside the realm of official function, a de-mentalized world that the movie presents, moreover, as appealing. If there’s any artistic unconscious or second level to “The Last Jedi,” it’s in a recurring plot point involving the very notion of mind control. And if there’s a sense of ego built into the movie, it’s with the built-in certainty that its maker and its viewers are on the right side of things. Lockstep consensus is cultivated not with chewily carnivorous troglodytes flaunting wanton violence and cruel spews of gore but with purpose and virtue, devotion and tradition, in the unimpeachable and unexceptionable name of liberation. “The Last Jedi” is a story about the Resistance, but the film itself is a cinematic masterwork of the First Order.